Collectors are itching for something new. You can feel it in the air. Finding growth within this industry today has become quite difficult. It needs a shakeup. But yet, there is nothing more exciting than pulling a big “hit” from a nice box of cards. In February I blogged about these really cool looking Sculpted Sketch Cards by Glebe. At the time they were making them for comic book and movie characters. Recently they wrapped up their first sports related Sculpted Sketch Card. This Michael Jordan Sculpted Sketch Card was recently finished for a private collector. These pieces look so awesome, and make unique additions to any collection. From the moment I saw them, I knew it wouldn’t take long until sports collectors would want them. I believe its only a matter of time until they strike a deal with a card manufacturer. What famous sports scenes would you like to see done like this? Babe Ruth’s “called shot” with the bat coming right off the card would be neat. 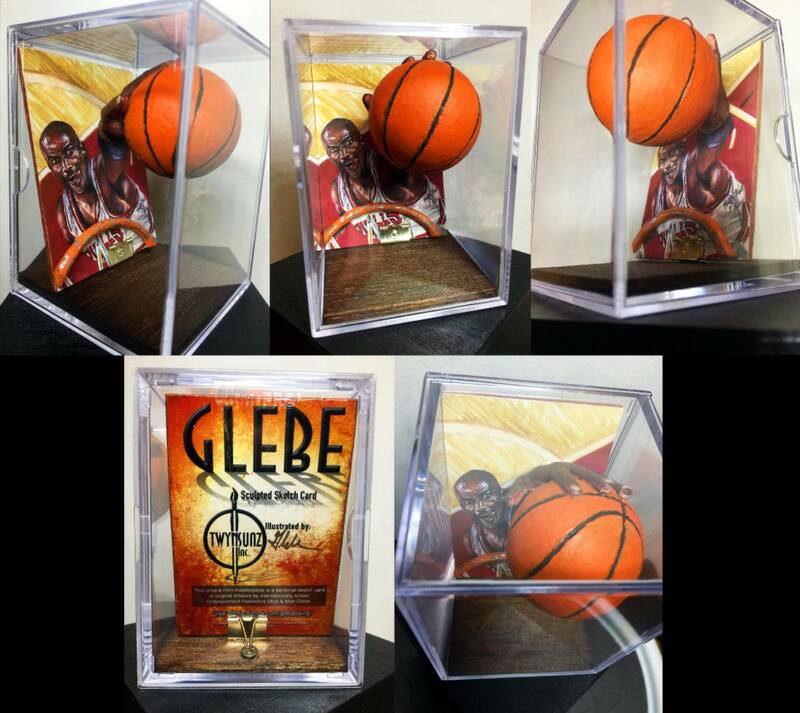 Be sure to follow Glebe on Twitter and Facebook to keep up-to-date on their latest artwork. 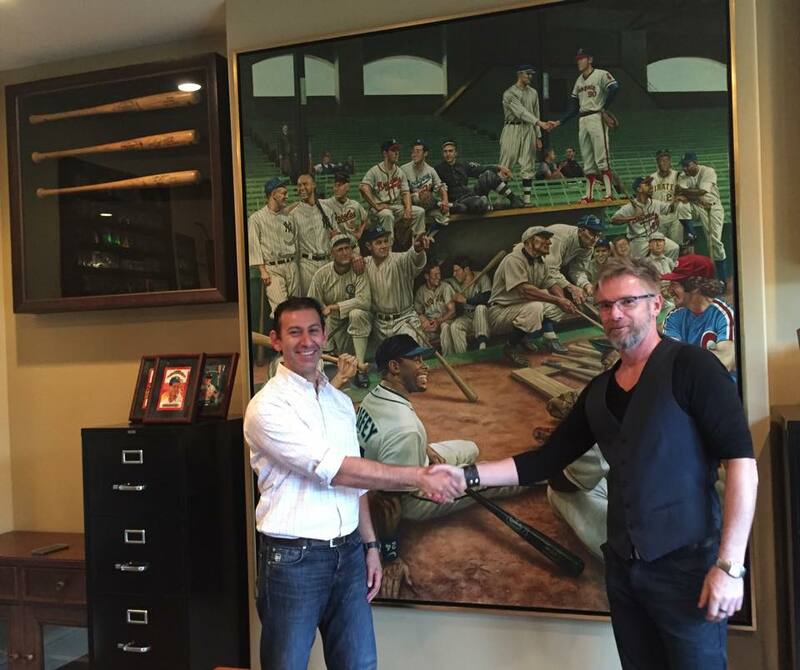 Renowned sports artist Jamie Cooper recently completed his latest piece of MLB artwork. This masterpiece was done for a private collector in California. After working on it for three years in Australia, its finally arrived in its new home. Complete with a museum grade frame of water gild gold leaf. This All Stars painting now rests peacefully in what looks like a very high-end collection located on a sprawling seven-acre estate on the side of a mountain. The collector’s name was left unsaid for privacy. I think we can all agree this collector has some cool stuff we can only dream about owning. Jamie Cooper documented his entire trip to the U.S. on Facebook. There you can see where this painting now resides. In addition to the painting, its fun to look around the room to see what else is there. I spot a lot of bats, and what looks like some 1992 Donruss Diamond Kings – Supers. Jamie Cooper is pictured on the right, with the owner to the left. One glance at this painting and you’ll see a who’s who of ballplayers coming from multiple generations. Much like the Phillies and Yankees Dream Scenes he has done. My eyes go straight to Mike Schmidt. That powder blue uniform and red hat really stand out. 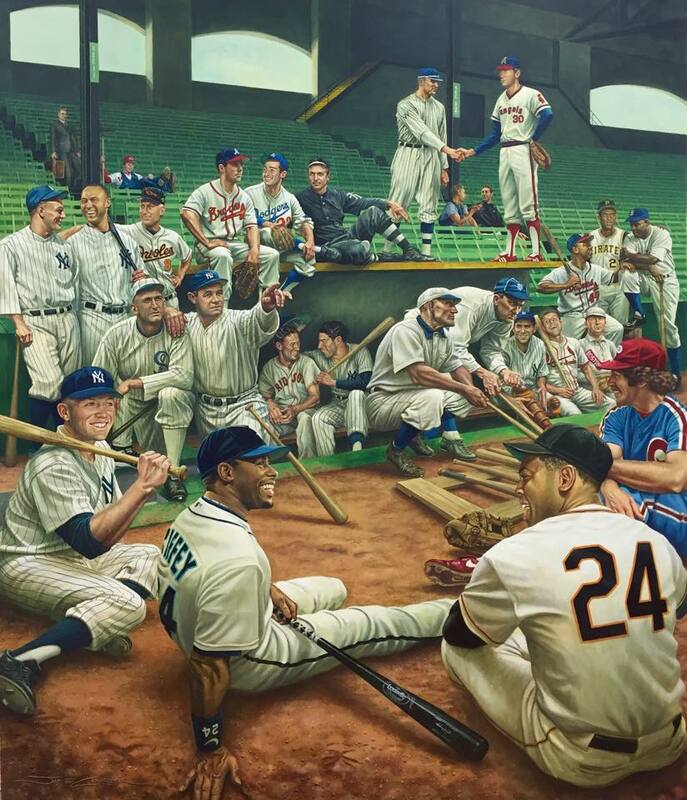 I think I can even see Jamie Cooper and the painting’s owner back there behind the dugout next to Nolan Ryan. I wonder what all these guys are talking about while sitting around 1933 Comiskey Park? Card companies here in America need to recognize Jamie Cooper’s talent. His work would look great on some MLB sets. He’s already done caricatures for an AFL product. 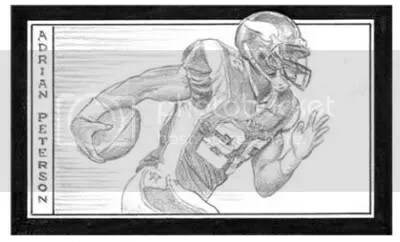 Sports artist Monty Sheldon has wrapped up his final eight sketch cards that will conclude his 2009 sketch card set. Within the last year, Sheldon has drawn 250 sketch cards which have all been distributed through eBay. These last eight cards include Chris Osgood, Kevin Garnett, Tom Brady, Adrian Peterson, Larry Fitzgerald, Eli Manning, Peyton Manning and Zack Wheat. Over the coarse of the last year, these cards have been selling for $50.00 to $200.00. Collectors seem to like these sketch cards more than some of the ones that can be pulled from packs. It won’t be long until he starts on his 2010 set. Be sure to check out his auctions here.